Retirement as special as you are! Get unforgettable retirement party decorations in a click. Retirement marks a major milestone in life and should be recognized in a memorable way.Retirement parties are a great way for an organization to show its appreciation to the retiree. So if you really want to make a retirement party stand out and memorable for the retiree opt for this party decor experience from CherishX which includes banner, flowers, balloons and much more. Over the course of the next 19 years, every day more than 10,000 Baby Boomers will reach the age of 65. India’s largest generation is not only aging, but in fact retiring. Retirement is a big deal. It marks the start of a new chapter in someone’s life and the end of their career, or perhaps the start of a new career. So of course, with big life changes comes a celebration: a retirement party. 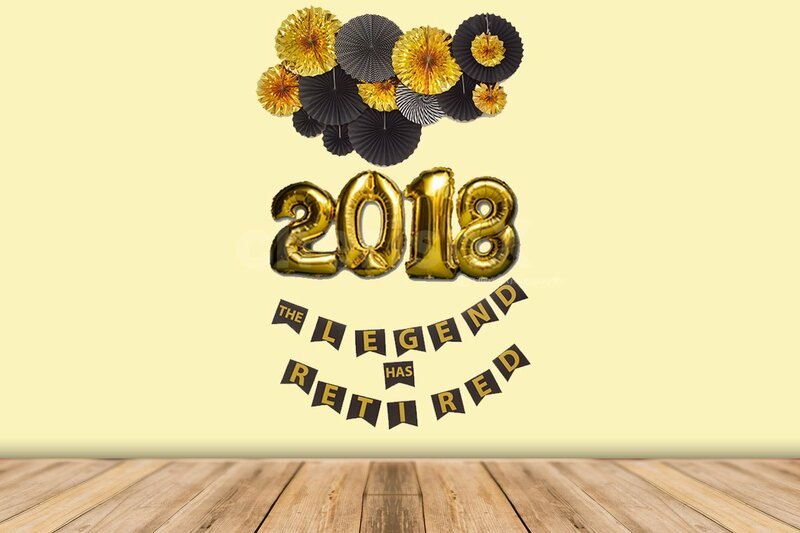 They put a lot of hard work into your company over the years, so it’s nice to do more than just a cake and say ‘see you later.’ No matter what, a retirement party should be a memorable one, so appreciate their hard work by putting 'The legend has retired' banner alongwith 2018 Year foil balloon and rosettes. Let it be an unforgettable affair! You can also opt for farewell backdrops instead of retirement with the same inclusions(farewell banner, colourful rosette backdrop, an year 2018 foil balloon and free floating balloons). Add customizations to make this celebration more memorable.